Our passion is football - teaching you all about the game including skills & drills! I have put together of the best soccer training equipment to improve all aspects of your game. Running, jumping, power and pace just a few things you can improve on if you decide to use any of the training equipment from this review. We all know in soccer you need the basics to play the beautiful game such as boots, shin pads, socks, shorts and a shirt, even a water bottle, and especially without a ball it would be difficult to play the beautiful game. If you are looking for the basics then sorry for you but this is not that type of review for the basics. I will be looking at equipment designed and made for a specific purpose to help improve your game. You want to have quick feet and power in your running don’t you? The companies who make the equipment spend hours & hours scientifically testing it to find ways to make it better so that when you use it for it’s specific purposes it basically “does what it says on the tin” as the saying goes. Soccer equipment that gives you quality & safety, while making sure it improves what skill you want to get better at while practicing & training for a soccer match. We can all run back & forward, side to side , then fetch a football and start to kick it about. The basics, remember “ the key to get ahead is to get started”. What if one day you decide to say that’s good I have got the basics but is there some way I could find an extra 5 yard of space or control the ball with a precision first touch?. What if you would like to increase your power in your shooting, how would you go about this? It is simple use a piece of equipment that will improve those muscles in your legs or the movement of your feet. That will sharpen your control or maybe help you find the top corner of the net. This is why you may need a piece of training equipment especially designed for soccer training and practice, that will definitely work for you and help your game and skills improve beyond all what you thought was possible and get you playing like the professionals. This is where I hope this review will come in handy. I have done the legwork for you, put in the extra sessions & looked around tirelessly to find the best to help improve your game. Now you can just find what you are looking for and get on with becoming the best footballer you can be. Fast footwork, incredible pace and strong as a lion, could we see you playing at the highest level in the next few years? How much does soccer equipment cost? If you buy the basics it is a relatively cheap sport for anyone to play. If you buy some boots & you have a kit to play in, then you are on your way. Sometimes you don’t even need boots just the football and its game on. Let’s say you start playing and now get hooked. You decide you want to get better at heading or running faster for instance, so now you think how can I improve my game, step in up a level or two. Next step find some specialised equipment to make it easier and do this for you. This is where I step in and give you what you are looking for. The best that soccer has to offer based on quality, price and customer reviews. That is why there might be a need for this review. I hear you saying I haven’t answered the question about how much it actually costs. That my friends is tough to answer. Like anything you can get from the cheap to the very expensive. Buy too cheap and you may be replacing it sooner than you think and buy too expensive it may put you out of pocket in the short term but give you the quality you want from it. Ultimately the choice is yours. I have provided both ends of the spectrum for you to look at. These are simply a ladder with rungs on it, that you pace along the ground and it stretches out over a certain number of meters. How to use it correctly? You start at one end of the ladder and run at full pace while placing your feet in between each rung of the ladder until you get to the other side. Then walk around back to where you started and go again. The aim of the speed agility ladder is to get your feet moving fast in a small space. This classic piece of equipment is widely used as it can be moved around easily and stored in a compact space. It comes with its own carry bag and includes a ladder drills Ebook to help you get ahead. Place the Agility Hurdles in a straight line, with a small gap in between each one. Start at one end and with your feet together hop over the first one and move on to the next one. Complete the set of six, then walk back and start again. This product has its own carry bag. Use these poles to increase your speed or for way of improving your ball control. Stand the poles in an upright position and the aim is to weave your way from one end to the other, then walk back to the beginning and start again. Without the ball the aim is to sprint through them as fast as possible. This gives you improved balance as you will be moving off both the left and right feet. With the ball your technique will get better the more you use them. Again always try to use both feet when weaving in between the poles. The poles are upright to help give the impression of a player in front of you, who you would need to get around. The aim is to kick the ball as hard or soft as you like into it so that the ball rebounds back at you at speed. This football rebounder does what it says, the aim is to shoot towards the net and the ball will rebound back to you. Thus giving you the way to improve your control of the ball. Improves your shooting ability as it is a smaller target to aim at. You can train by yourself with this piece of equipment. The aim of this product is to get you hitting small target inside the goal with your shooting. The target nets can be hung up inside any standard size goal. 7 scoring zones for you to aim at. Designed in the UK by football players for football players. Used by professional football clubs, schools, colleges all around the World. You attach the umbrella to your waist and then sprint as fast as you can. This umbrella will cause a resistance to your running ability. Using this repeatedly will increase your running power and speed. Has 2 speeds and is 56 inch. Used for soccer training and weight bearing. This product is designed to be used on your foot. You attach it around your foot like a band. The purpose is to provide instant feedback to the player. Reinforces proper touch and technique. Helps build muscle memory which is the key to proper ball striking. Let you be incontrol of mastering our technique. Fits all parts of either foot. Fits all shoe sizes from youth to adult. You strap the cord around your waist and them move forward, letting the resistance band take full affect. Maximise your power,strength and speed. Can be used by yourself or with a partner. This ball is designed with the latest technology and has integrated sensors which send your kick data information instantly back to a compatible app. Smart ball in white & is standard size. Training tool for placing kicks with precision. Enable users to perfect their technique for power,bend and swirve placed on the ball when kicking it. The sensors inside gather information on strike point,speed, spin and trajectory. Compatible with iOS 7 & Higher also Android 4.3 & higher devices with bluetooth smart connectivity. It takes a lot of work and dedication to make it to the top. The joy about soccer is it is fun to practice and train, most of the time it doesn’t feel like you are even working that hard. The saying goes do something you love and it wont feel like hard work. So enjoy all those extra hours you will be putting in using your new pieces of soccer training equipment and be the best you can be. If you want give up or quit at getting better just remember why you started in the first place. Even if you don’t make it to the very top like best players, the Messi’s or Ronaldo’s of this world. You will know that your own personal game has improved from where it once began. Good luck and get practicing. I would love to hear from you so please leave me a comment. I am a businessman, husband, and father. I earn money every time someone clicks on one of my links. Just a few month ago I knew nothing about working online or how to earn a passive income. You can join me and learn how to do the same. I write about football, my hobby and passion. Write about your passion – no matter what your interest is? Could you Imagine working online at home or anywhere in the world with an internet connection? Let me show you how you can work from home in your own time – without quitting your job – and make money like a footballer. You can Start learning for free now…. 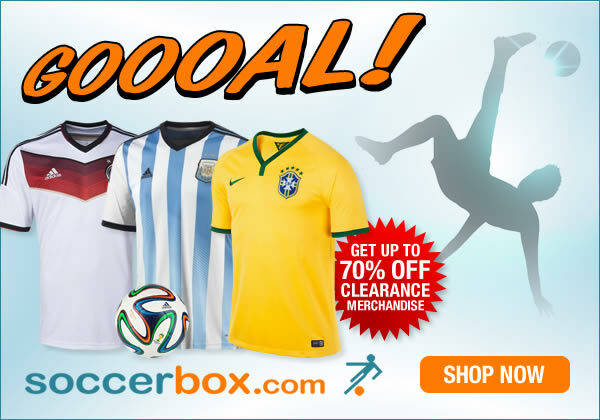 Visit Soccer Box for Official Soccer Jerseys from the Premier League and around the world. & Get Up to 70% Clearance Merchandise Today! Firstly hello to you and welcome to our fun football site. I am a business man, husband and father. I Live the good & happy life and love working online blogging about football. Would you like to change your life & learn how to do what I do & write about your passion? Matthew Hofman on What is the most important thing in soccer – to entertain or to park the bus?